Each set includes 1 pad of 50 white sheets, plus 30 white envelopes and 28 matching self-adhesive glossy white address labels. 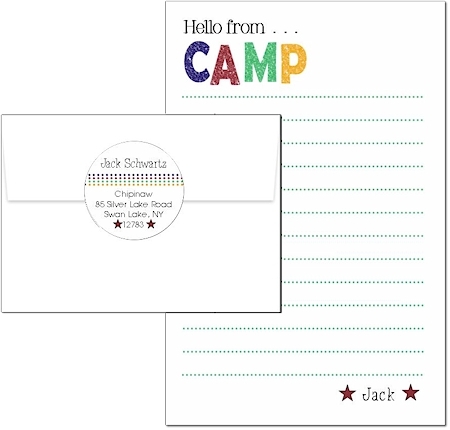 Perfect for your letter-writing camper. "Hello from CAMP" at the top is only as shown. You specify the text to print at the bottom of the pad. Labels - 2" x 2"
Each set comes with 28 matching self-adhesive address labels. Extra labels are available for an additonal fee. Each set comes with 30 white envelopes. Extra envelopes are available for an additonal fee.